I found this old wok in my new apartment, and I was wondering if it would be useful (and safe) to use after completely scrubbing off this kind of black enamel, which is already wearing down. What kind of lining do you think it is? It is black and glossy, not a matte finish like your classic Teflon or any other non-stick lining I've seen before. The way it is flaking off (flakes sticking out instead of breaking off) suggests it is an old-school (non reinforced) teflon coating, not an enamel. If the underlying metal is actually stainless (not likely to be carbon, would not look bright after that abuse) steel, you could make it usable, but it is unlikely to be worth the effort - the remaining coating won't come off as easily as you think. If it is aluminium, forget it - bare aluminium cookware is controversial from a food safety/health perspective, especially if the unknown alloy used wasn't chosen with intent to be a cooking surface. As it is, it is unusable as a nonstick wok - which is best for some stewed/braised dishes - but you want an intact coating for that. It is unusable as an uncoated wok, where the last thing you want is any nonstick coating that can only take limited heat - even if intact that is. Some modern nonstick types that are rated to 350 or 400 °C (not °F!) could be ok for a saute/stir fry wok - old school soft teflon isn't. The example shown would, at best, serve as a driver for bamboo steamers. 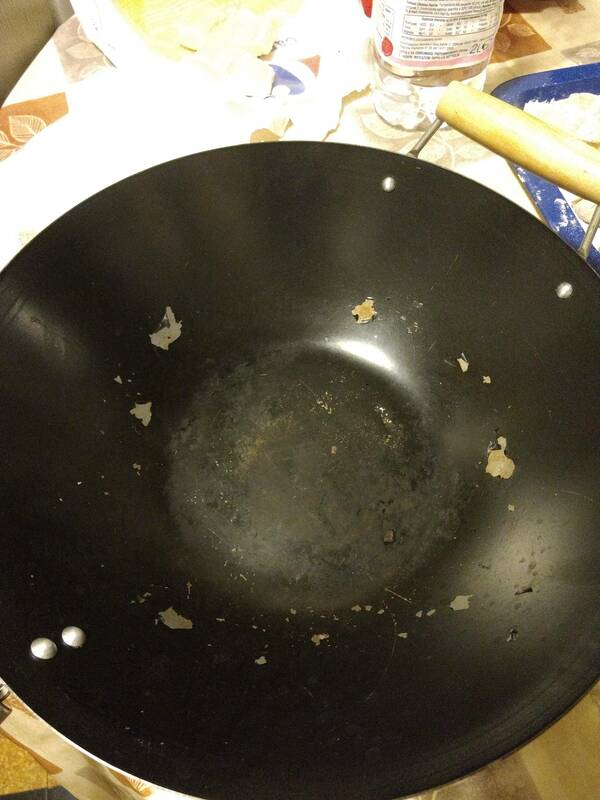 It looks like to me that the wok has some sort of nonstick coating which is in very bad shape. I wouldn't use it. If you want to cook with a wok I suggest that you buy a new one. Ah.... I thought you were referring to a previously seasoned "raw metal" wok, where you'd remove the seasoning and start fresh. One with a factory-added/bonded coating that is flaking off.... not worth the effort to try and get all that coating off, the quality of the wok underneath it would be questionable, as far as being something you'd want to season and continue to use, and the coating materials that are mostly fine, while bonded to the metal, are pretty nasty if ingested, and you'd run a high risk of not perfectly stripping the wok to bare metal, which means you'd be ingesting loose bits of the chemical coating in your food. Just buy a good high-carbon steel wok, season it, and go. Those things never wear out, and the seasoning improves over time. Mine was my first late-night infomercial purchase ("The hand-hammered wok! "), over 20 years ago. Still performs like a champ. You might even be able to find one really cheap at a second-hand store or garage sale, and those you'd be able to strip down and re-season if it was looking the worse for wear. Here are instructions for how you strip down a cast iron pan to bare metal to start fresh and re-season. I can't imagine it would be any different for a carbon-steel wok, if you get a second-hand one. I recognize that as a mainstays wok. Get rid of it. It's literally $5. Think that lining is a paint, but I never figured it out either. Not the answer you're looking for? Browse other questions tagged wok non-stick or ask your own question. Hard anodized wok without scratch-resistant coating? Can a wok be used with home gas stoves?